I'm a talker and talkers don't exactly have a reputation for listening, however misguided that may be. I love listening, even if it's not always obvious. I'm a reader, an apprentice, a wine taster and now a wine maker. I want to learn, to know what you're thinking. I want to read you. To listen. So it is with wine. We use terms without even thinking what they really mean. "This wine speaks to me." "That wine was singing last night." "This one didn't have much to say." Even the notion of terroir requires the wine to speak and us to listen - to the sense of place, the somewhereness of the wine, its reflection of the growing season and grape. As tasters, we must listen, and listen carefully in the case of more delicate grapes and wines like Pinot Noir and red Burgundy. I make Pinot in part because of that. I want a wine that compels me to listen. Last night I opened the first of several bottles from Pierre Guillemot that purchased recently, red Burgundies from several vineyards in the village of Savigny from a producer known for delicate, perfumed, ageworthy wines. 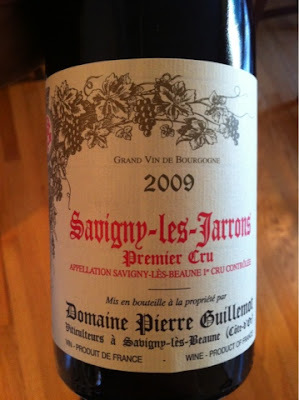 I opened this one - the 2009 Guillemot Savigny-les-Beaune Jarrons 1er Cru to get a read on it, and the others by extension, to listen and then to consider when the others might speak their best. No surprise, this wine is an infant and was decidedly not singing. It was delicious, with a transparent but deep red raspberry color and a dusty through quiet aroma. Its perfume has not yet evolved, something careful aging should bring. The flavors were bright but rich, showing the warmth of the vintage, with a young, unresolved texture much like fruit that needs another day or two on the counter to smooth out and come together fully. The read on this wine? Leave it and presumably its siblings in the cellar for several more years. Not that you can't enjoy the wine now, and I did. Nor was any of this surprising - the wines of Guillemot always need time. So much more from this wine will come in time, or should. So much more of its story, what it really has to say. I'll be reading and listening, however long it takes. Reading requires patience, something I also don't always have a reputation for having...but how can you not when your devotion is wine. I had the pleasure of tasting through a line up of red and white wines from Corsican producer Antoine Arena last night at Storyteller Wine Company in Portland. As readers and Twitter followers may have noticed, I'm a little obsessed with Corsica, declaring this the Summer of Corsica. Ok, that moniker hasn't actually caught on. It's more a sound-of-one-hand-clapping movement, but I'm happy. I love Corsican wine. Perhaps it's too much to say this, but they make me better. They inspire me and make me pause at the same time with their beauty. It's love, it's that simple. I want. Antoine Arena makes wine from the Patrimonio AOC in the north of the beautiful island. The line up this night was three white and three reds, all recent vintages that I didn't fully note. So consider these thoughts as impressions of the range of Arena wines, not necessarily specific comments on specific wines. The Bianco Gentile is apparently an indigenous Corsican white grape variety, the wine pure and delicious, round and yet focused as I'm finding so many Corsican whites. The Blanc Carco is all Vermentinu (Vermentino in Italy) and lovely with mineral and lemon flavors. I'd love to try older examples to see how this ages. Then the 2010 Blanc Grotte di Sole, oh my, this is the wine of the line up for me. All Vermentinu again, as so many Corsican whites are. There's truly old vine intensity here, just a deeper, richer but still delicate impression, truly compelling and wine to age for many years I would imagine. I believe all these whites were 2010s, so very young still. Correct me if I'm wrong on the vintages for the first two, readers. Moving on to the reds, I must say that if there's a weak spot in Corsican wine, it's the reds. They are or can be delicious, but some just aren't nearly as compelling as the whites and pinks. Maybe it's a factor of my tastes evolving, where I'm not necessarily so big on the riper, coarser wines of southern climes compared to perhaps more focused and precise reds of northern Europe or cooler southern climes. That's speaking very generally of course. The first red is the 2010 Cuvee 0, a no sulfur cuvee that reminds me why I like sulfur. I think in analogies, so consider sulfur in wine like the focus mechanism on a camera lens. Sulfur to me, in judicious amounts, helps the truth in a wine come into focus. A lack of sulfur on the other hand is sort of to wine like room temperature is to milk. Sometimes things you don't want end up happening. This wine is delightful to some people, but to me the lack of sulfur seems to leave the wine muddled, with a bitterness on the finish from (I imagine) less desirable yeast or bacteria. This is a wine I'd rather drink at the domaine or at least on the island. Then the '10 Rouge Carco that's made with a bit of sulfur and has more non-literal clarity than the 0. I am reminded of southern Rhone reds, another factor in me not loving the reds as much as other Corsican wines. The whites and pinks somehow taste like Corsica to me, even though I've never been there. The reds make me think more of the Rhone, which isn't bad, just not as distinctive. More tasting is necessary. This is good wine, just not as compelling to me. Finally the '09 Rouge Grotte di Sole. Now we are talking. Rhone-esque but with an intensity that makes you notice, a character that's compelling and makes me wonder what the future holds. It's smoky though apparently there isn't a lick of wood in the whole cellar (I believe everything is done in concrete). There's great texture, something I'll say of all these reds. No polish. No falsely rounded edges. No, these are wines that stick rather than slide away, like wines that seem to be afraid of owning up to who they really are. This red Grotte di Sole is just fascinating wine, but for the #summerofCorsica perhaps this is more appropriate for the coming #winterofCorsica. Yes, I'm planning already. You don't need to doubt it. More on Arena at Kermit Lynch's website. And for you French language enthusiasts and/or those who like pictures of the insanely rocky vineyards, check out Antoine Arena's website.